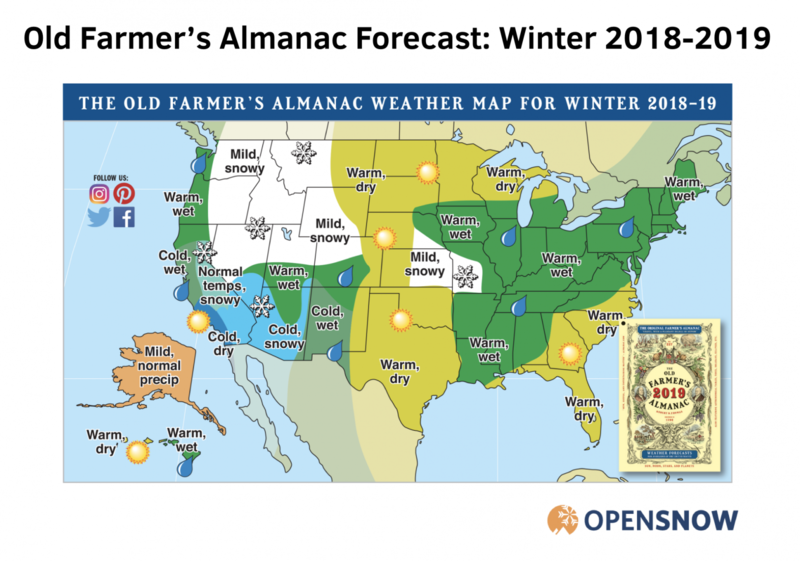 The Farmer’s Almanac publishes forecasts every August that look ahead to the upcoming winter season. These are widely circulated as a bonafide forecast for what to expect during the winter months across the United States. But before taking these to heart, shouldn’t we first look back and see how they performed last year? Most certainly! One quick note to start. There is not one but two Farmer’s Almanacs. The "Old Farmer’s Almanac" was started in 1792 while the "Farmer's Almanac" began publishing in 1818. To be fair, we'll analyze both against what happened during the 2017-2018 winter. 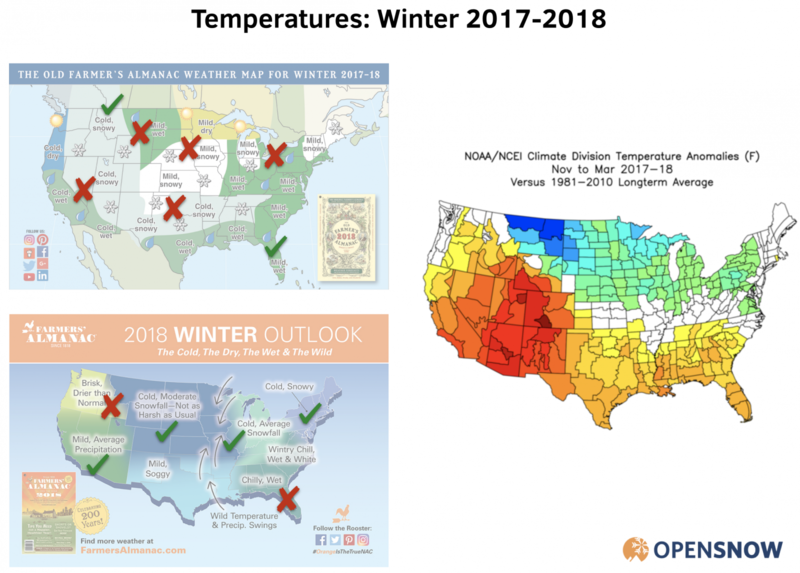 Let's begin by looking at both Almanacs for the 2017-2018 winter compared to the actual temperatures recorded between November 2017 and March 2018. The Old Farmer's Almanac (top image) is harder to verify since it doesn't break apart the country very well. They were incorrect across much of the West where they predicted cool temperatures, while most locations were warmer than average. The Farmer’s Almanac (bottom image) is easier to verify since it breaks apart the US into simple regions. They hit the temperatures correctly in spots across the middle of the country but missed the warmer than average temperatures in the Pacific Northwest and Southeast. 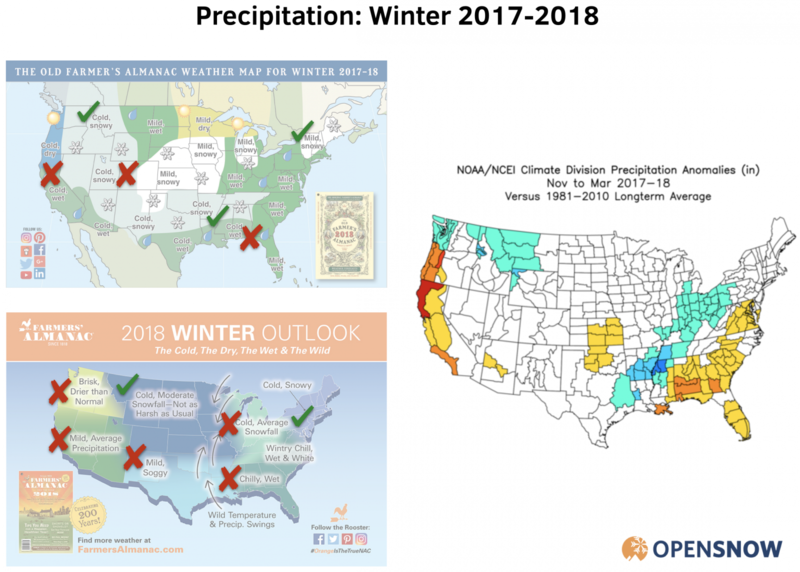 Up next are the forecasts from both Almanacs for precipitation (snow) between November 2017 and March 2018. Both Almanacs were wrong about California, Utah, and Colorado as it was dry compared to forecasts of "snowy" and "moderate snowfall". 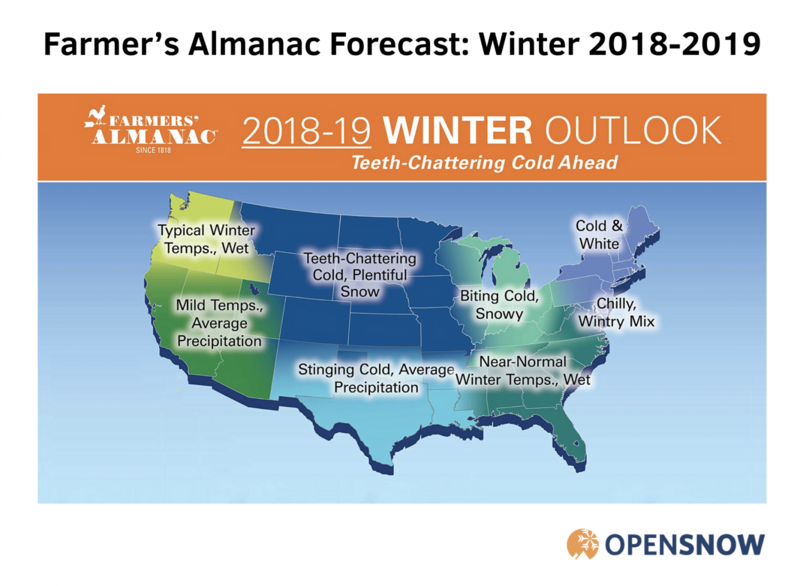 Both Almanacs did a pretty good job of predicting a "snowy" winter in the Northern Rockies and parts of the Northeast but overall, the forecasts do not inspire confidence. Since there's no track record of accuracy from the forecasts produced by the Farmer's Almanac and the Old Farmer’s Almanac, we continue to have zero confidence in their forecasts for the upcoming winter season. As we'll continue to mention here on OpenSnow, long-range forecasts are rarely accurate. These forecasts cover multiple months but we know that skiing quality improves and degrades with storm cycles that last a few days to a week. Paying attention to a 1-10 day forecast is the way that you'll find powder and give you the best information for your weekend trip or destination ski vacation. 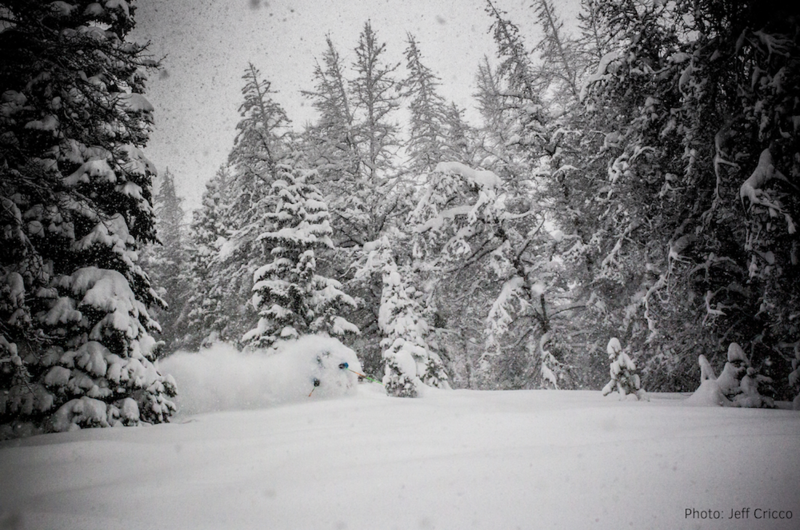 Thanks for reading, stay tuned to our local forecasters, and keep dreaming of future powder days!